Improves the adhesion of the varnish of completion of the micro-cement. Increases the resistance to the step of liquids along its capacity of sealed. Its application Is possible between the coat of the micro-cement to improve its adherence and impermeability. Its use adept the support in order that the completion varnish could have the gloss degree gloss referred in the specification sheet (although this value will depend also on the smooth completion and on the color of the micro-cement). 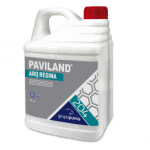 In case of microcements of high porosity, apply a first coat of Paviland Arq resin diluted with 20% water. Once dry, about 2 hours, but always before 8 hours, lay a second hand undiluted. Once dry the second hand (2 hours approx. ), and 8 hours later, apply the Paviland Arq varnish according to the technical data. For microcements of reduced porosity (the usual case), apply a single coat of Paviland Arq Resine diluted with 10% water. After 2 or 3 hours and always before the 12 hours, proceed with the laying of the Paviland Arq varnish. Supports must be clean, free of dust, fats, oils, liquids, gratty, etc. Do not apply with high humidity, strong wind or frost. Do not apply below 10 ° C or above 25 ° C.
Ensure good ventilation of the room during its application. Wear gloves and safety glasses during its application. Remains of product should not be pour into rivers, sewers, etc. The micro-cement must be completely mature before the application of the Paviland Arq resin.